I’ve already written about how the trend towards decentralization is going to change the nature of investing, but that was before Facebook’s stock took a historic pummeling on account of bad earnings and Apple became the first trillion dollar company on account of good. The violence of both moves set off my ex-trader’s spidey sense that this might be the kind of volatility that precedes a change. Markets are devious, and love sucking everyone into a particular investing thesis right before proving it wrong. In the year leading up to the financial crisis, bank stocks were soaring (because home prices could never go down) and the price of oil was spiking (because supply could never go up). The housing crash and fracking boom swiftly proved otherwise. Today, it’s almost impossible to imagine a world where the FAANGs - Facebook, Apple, Amazon, Netflix and Google - aren’t dominant. That’s why it’s a good a time to start selling, and diversifying into the decentralized platforms that will eventually replace them. I know that this is a bold and seemingly hyperbolic statement, and I usually prefer not to give investment advice. But this particular setup is too sweet to ignore, so bear with me as I lay it out. Companies like Facebook and Google get a lot of criticism for being too big, but that’s a political opinion, not an investment thesis. Dominance might be bad for society, but it’s good for business. The better reason to sell is because the fundamental structure of those companies is slowly becoming obsolete. Their kind of corporate structure made sense during the industrial era, when you needed a centralized hierarchy to deliver complex durable goods like a car. It still made sense as we transitioned to the service economy, because branding and a homogeneity of experience mattered. But the model that work for GM or McDonald’s doesn’t work for a digital platform, because it leads to a misallocation of resources. Think about the difference between a privately owned fleet of taxis and Uber. A fleet can enjoy economies of scale by raising capital, buying cars, having its own repair shop, and so on. Uber doesn’t do any of that. It just provides a convenient platform for drivers (who have their own cars and pay their own mechanics) to be hired by users. So Uber is not a taxi company. It’s a platform for countless little taxi companies, each of which has to do all the work AND take all the risk. And yet, Uber still takes as big of a cut as a traditional fleet operator. But hey, at least Uber still pays most of the revenues to its drivers. Companies like Facebook and Google pay virtually nothing to those doing the heavy lifting. Somehow, even though it’s their users that invest resources to create their content, the platform ends up capturing most of the profit. A video like Psy’s Gangnam Style clearly required a heavy investment of time and money to make. If it had been a dud, the failure would not have cost YouTube a cent. So why did Google take most of the profit when it turned out to be a hit? All social media platforms - not to mention the iTunes ecosystem and Amazon’s digital services - have an asymmetric risk/reward profile, so it’s worth asking why we as users put up with them. The answer, until recently, was because there was no other way. The internet has lacked a proper business model from day one, as anyone who worked in the music business 20 years ago could attest. Today’s centralized platforms were the first solution to that problem. We can criticize iTunes for the paltry fees it pays musicians to stream their music, but it’s still an upgrade over Napster. The mistake was forgetting that this was only a temporary solution. A system where a large corporation captures almost all the value created by users is not good for anyone - except shareholders. A decentralized platform solves this problem, because the platform user and owner become one. There is still plenty of risk, but at least the rewards now go to those who deserve it, as has been the case with the first economically viable decentralized platform. Bitcoin is different things to different people, but technologically, it’s just a decentralized content platform — - for payments - that’s worth over $100b. Miraculously, all of that value is captured by its users. There’s no Bitcoin Inc. benefiting from someone else’s foresight. That model of decentralization is now being applied to every other kind of content company out there. To me, it’s not a question of whether such platforms will eventually cannibalize today’s centralized counterparts. It’s a question of which, and when. Which brings me back to your FAANG stocks. Even if you aren’t ready to sell, I recommend hedging your investment with a small investment in their decentralized counterparts, each of which is represented by a coin. If you don’t know which coins to invest in, then allow me to introduce you to BEEStMoD: The two Bitcoins, Ethereum, EOS, Stellar, Monero and Dash. These coins represent the most important blockchain projects being developed today. Most of them focus on decentralized payments, cloud computing, or some combination thereof, which makes sense, as those are the two pillars of any successful online platform. As an added bonus, you can currently buy into these platforms at recent lows, while selling your FAANGs near all-time highs. 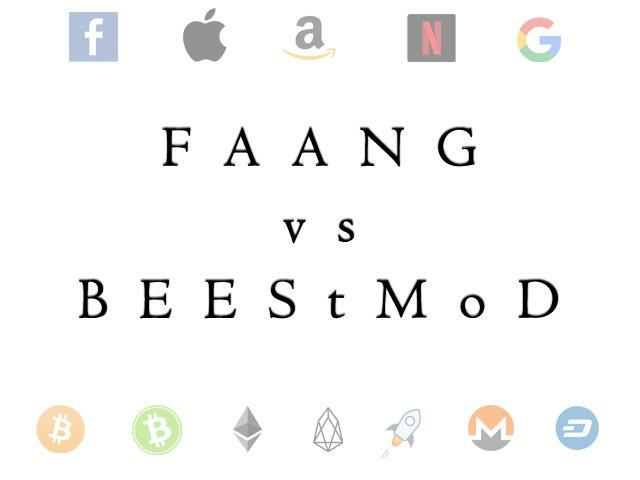 My two cents (or Satoshis) have at times cost others a lot more than that, but I’m confident that five years from now, $10,000 invested in BEEStMoD will have done much better than the same money invested in FAANG. In fact, I’m willing to bet on it, and to do so publicly, buy doing the very technology I recommend investing in. In my next post, I will describe how.